Today was the last home series for the local Canberra Cavalry in the Australian Baseball League. The team were in second place on the ladder before the series and now they are tied for third place with three other teams. The boys lost four straight games on Thursday, Friday and Saturday, so in an effort to change things up a bit, I painted some Cavalry themed nails, grabbed the kids and headed out to the last game today. For past reference here are Cavalry Nails #1, Cavalry Nails #2, Cavalry Nails #3 and Cavalry Nails #4. Let me say I'm no Jane from Nailside when it comes to tape manis! The macro zoom does me no favours, cause you can see all my bleeding lines and dodgy black stripes. But from a distance these looked really awesome and I had several comments! I did one coat of Ulta3 Lily white, one coat of Kleancolor metallic white, then did the taped sections using Kleancolor metallic orange. I used a long striping brush dipped in Kleancolor metallic black as the pin stripe. The a coat of Seche Vite top coat. Oh, and in case you were wondering, my nails clearly made all the difference again today cause the boys finally came away with a win! littlepickle - no the white is really sheer, if you want it to look white, you need to layer it over white. But ever other one is just awesome. 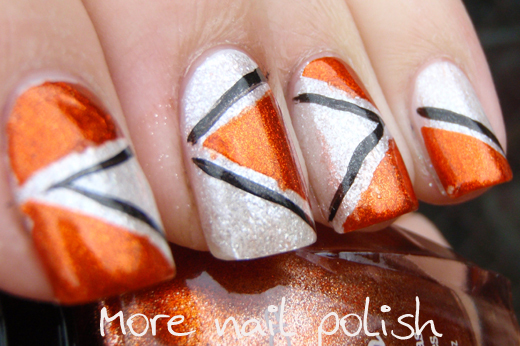 This mani is so great! 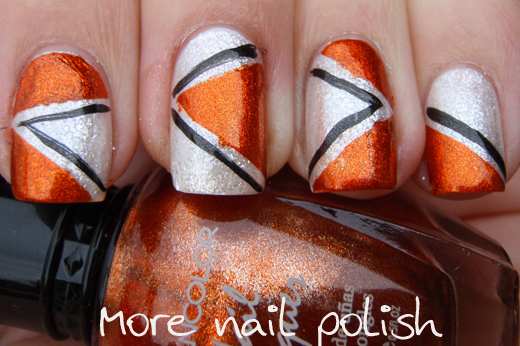 Finally commenting to say I love your blog, your positive attitude, your beautiful nails and your great pictures! Keep up the great work! 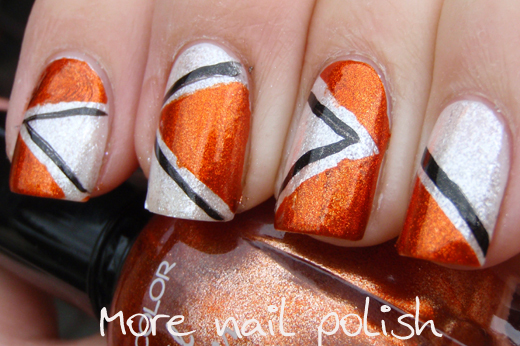 Raibowify Me - ooh yes, these colours would be perfect to do Finding Nemo nails, and Mr 3 just watched it for the first time last week - he'd think Nemo nails would be so cool. Get your Aussie on - Oi, Oi, Oi!